Fold up your map, put away the guidebook and let the GoCar show you what most visitors never see! Zip around in a cute, yellow GoCar as it takes you on your own GPS-guided tour! This 1 hour tour takes you to the Golden Gate Bridge along San Francisco's beautiful water front Marina District. You will get to see the towering 400ft bridge above you and then, if you wish, park at the vista and walk the span! Loop back thru the Presidio and down curvy Lombard Street to finish. Since they're GPS-guided, the GoCars know where you are even if you don't! With you in the driver's seat, it not only tells you where to turn, it also tells the stories that bring San Francisco to life. Follow the directions, or for those more adventurous, blaze your own trail at your own pace! GoCars hold a maximum of 2 people. Prices are per GoCar, not per person. 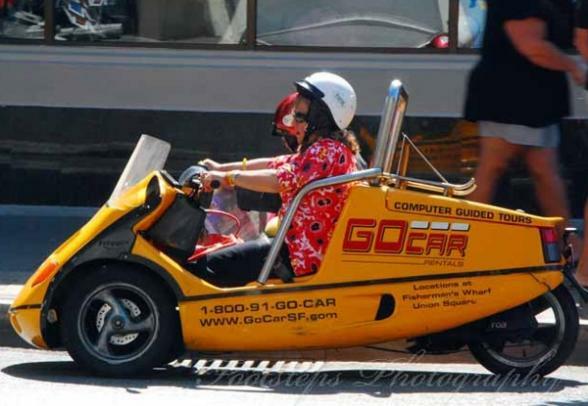 You MUST be 21 years or older to rent a GoCar, and you MUST possess a major credit card and a valid driver’s license. (International license is not necessary). GoCars do not accommodate car seats for children. Photo ID is required. Helmet requirements follow State law. On the day of rental, a $300 security deposit will be held on a credit card until the GoCar is returned. All riders must sign a standard participant agreement. Renters will have the option to purchase Collision Damage Waiver (CDW) insurance on the day of rental. Renters are free to extend the length of their tour on the day of rental. Additional rental time will be charged at standard rates. Hotel pick-up NOT included. 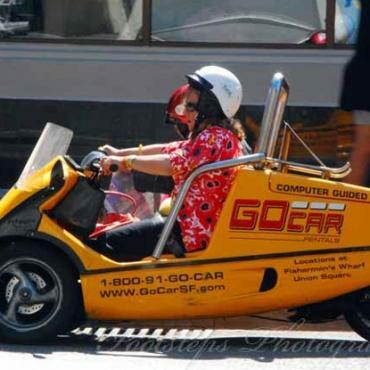 GoCar Tours San Francisco is located at 2715 Hyde St in the heart of Fisherman’s Wharf at the end of the Hyde Street Cable Car line at Hyde and Beach Streets. Your GoCar experience includes: Fuel, Unlimited Mileage, 2 registered drivers, Helmets, Insurance (additional collision damage waiver is available) VAT. Prices from £33.00 per GoCar (Child prices not applicable).